Criminal should not be allowed to move freely in the society, they must be arrested and put behind the bar and prosecuted as per law. Said Itanagar local MLA Techi Kaso today. He was replying to media person on the sideline of social service programme at H Sector today with regards to attack on old couple on wherein the wife died and husband received grievous injury in the outskirt of the Pachin area in Naharlagun on Wednesday last. He said that immediate arrest of the accused and criminal will be justice for the departed soul. But at the same time protesting and creating of law and order problem in any form will not yield any result rather appeal one all to share any information to help the police in nabbing the culprit at the earliest. While condoling the death of late Aisha Khatun wife of Md. Ramzan Ali who were residing in a OBT house in an agriculture field and working there as farmer or labour . 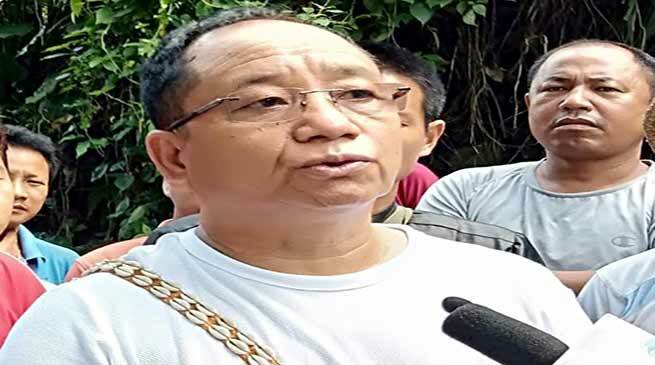 He also appeal the people and family members and relative of the victim to have patience and cooperate with police and requested the capital police to immediately arrest the criminal and prosecuted the under various section of the law. Kaso added.